Just when you think you’ve “seen” it all, there appears to come a perspective which you were least expecting… Only part of that is true, because for the Christian that is looking at what is going on around them – it also involves the people who are involved in what is going on around them. This week has been a week of tough rows to hoe for our family in many different facets, on so many different plains… Courtney knocked it out of the park with this poem that she presented to me last night after we had some one-on-one time to talk about some of those struggles. The perspective in this poem is simply amazing – from a 14 year old who has a penchant for noticing things that others don’t want to see. 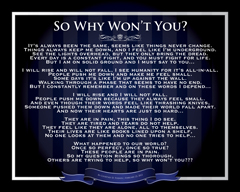 While I’ve been troubled for a specific person and situation, she put into words what I was having a difficult time doing… The situation are people hurting and the question is “So Why Won’t You?” – VERY POWERFUL! — with Courtney Turner.